Over the last decade Josh Maio has seen running evolve from stress reliever, while working and going to Columbia University, to an integral part of his life and who he is. Josh has participated in hundreds of races in the US and abroad, including 20 marathons with a personal best time of 2:50:29. "Speedy Sasquatch," as he is commonly referred to as, is an RRCA and USATF certified coach who began training runners through New York-based charity team Race With Purpose (RwP), which raised money to help the fight against childhood obesity. After two years with RwP and successfully coaching more than 55 athletes through two NYC marathons, he continued his coaching career working with individuals and eventually established his own team in 2009, Team Sasquatch, which was composed of more than 35 local and virtual athletes training for everything from their first 5k and 10k to Boston Qualifying marathons and ultramarathons. Since then the Team has evolved through his partnership with Gags and continues to grow with GCR. As National Endurance Team coach, Josh has successfully coached over 500 Team JDRF runners for half and full marathons in New York City, Long Branch (NJ), Miami, and Disney World (FL). In addition to these many accomplishments, he has also served on the "1st Time Marathoner" expert panel for the Marine Corps Marathon, and has represented Brooks Running as a member of their Inspire Daily (ID) Coaching program for the last 5 years earning ID Member of the Month honors in 2011. Kate McGowan joined the ranks as a competitive athlete at the tender age of eight. In high school, Kate participated in a variety of sports: she played tennis, ran winter and spring track, and competed in swim meets where she was the only swimmer from her high school (a team of one!). She then brought her love of athletics, team spirit, and competitive drive to college swimming. During four years on the Division 1, MAAC Women's Swim Team, she set multiple individual and relay records and was named team captain her junior and senior years. After college, Kate continued to stay active and has completed road races, RAGNAR relays, marathons, varying distances of triathlons (including Half-Ironman), and more. 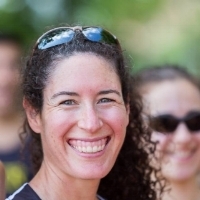 Today, Kate runs for Gotham City Runners and was part of the 2014 GCR Women's Team that won the B-Division Championship in the NYRR Club Competition. She has also qualified to run the Boston Marathon in 2016 and 2017 with a marathon PR of 3:24:48 at the 2015 NYC Marathon. "I love being a part of GCR! Running has built up my confidence, brought me lifelong friendships, improved my health, and overall made me enjoy life more fully. GCR is my family." I haven't always been active. In fact, I was pretty lazy growing up, preferring movie marathons to running marathons (or athletic feats of any kind). And yet, I changed my ways many years later when my friend challenged me to take a Level 1 NYRR running class to learn how to run a continuous 20 minutes. I survived. I ran the Nashville Country Music Marathon the following year, surprising everyone, including myself. The second I crossed the finish line, I was hooked. Eight full marathons, five olympic triathlons, and countless shorter distance races later, I couldn't imagine not being active. A rest day is sometimes the scariest day of the week. I love to challenge myself and set big audacious goals that scare me at first, but I've learned it only seems impossible until it's done. I've shared that message with other runners by coaching Team in Training's marathon team for the last four years. There's no bigger satisfaction than helping others reach their goals. Supporting first time and returning marathoners improve physically and mentally gives me the energy to push myself to achieve my own goals. I started working with Josh and Gotham City Runners almost a year ago when I wanted to double down on my own speed training. I've since gotten a personal record in a 5k, 4 miler, 10k, half-marathon (twice), and full marathon. I achieved what previously seemed impossible with my first BQ at the Steamtown Marathon in October. It's all about targeted training, a supportive running squad like Gotham City Runners, and positive energy - "she believed she could so she did."